My calls for a speculation section so far have been unanswered! Who would you like us to sign? 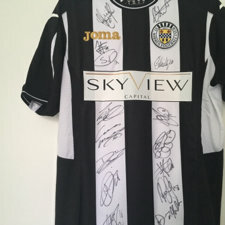 What players are currently free and looking for a club and may do a job for St Mirren? There IS a place for speculation, we ALL like to do it and thus far this forum does not really allow us to do it without comments (from people like me) such as "thats not a rumour". So please speculate here (and if you believe in such a section then maybe the mods will see it too) and it may make the rumour mill slighty more credible! Midfield.....Marcus Niculae now that he has been released? I'd love to see Sports Catering booted out of St Mirren Park, and replaced with a McHargs The Bakers Franchise. Prices must not be higher than their Shops. They're nearly as pricey as The C*rrs. That would be good ! Location:I am here . . I heard that was going to happen ..oh , sorry wrong thread..
Make me 2, auld yin ..
Wonder if we'll go after the lad Smith from Rangers again? We need a left back - high priority. He might be available cheaply as they are skint supposedly. Joe O'Cearuill - Remember him? Has been released by his current club (St Patricks Athletic). I personally was impressed by him when he was here on trial, standout against Rangers reserves (apart from Tcham N'Toya). Maybe bring him back on trial because he was wanting to join us. He's now a ROI internationalist and probably a good shout for a long term replacement for Haining/Potter. Yes Websters a great shout...that's the lad who signed for the h*ns maybe two years ago and had just about been injured since...get him onboard!! A guid Piemaker for a start.